Jerky is often thought to be made from horned animal's meat, but jerky can also be done from chicken. 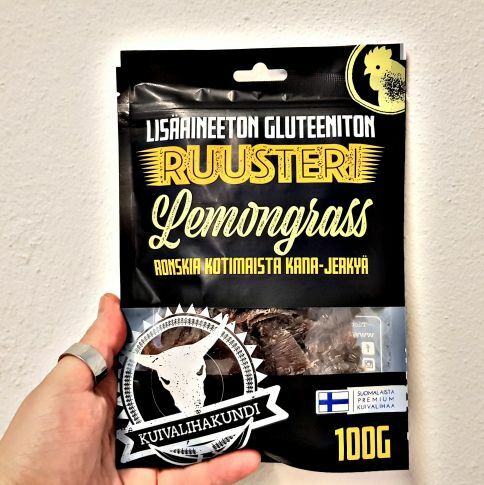 Roosteri chicken jerky is made in Finland and only domestic meats are used. Roosteri Lemongrass is spiced with Lemongrass, which gives it a touch of Asia. Plenty of lemongrass gives freh citrus taste. Ruusteri is a very good option if you avoid red meat and fats, but you love good protein-rich snacks. Roosteri is also suitable for athletes, as the product gives a feeling of being full, and the body gets the necessary proteines and salts at the same time. Dried chicken may sound like an impossible equation to be good, but yes, this is damn good.